Ah, baking. Whether it's scones in country NSW or a honey cake in urban Yaroslavl, it has the power to bring people together and rouse that competitive spirit. 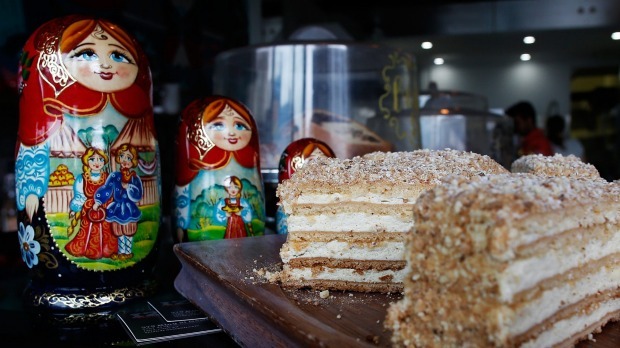 For Olga Rogacheva, friendly neighbourhood bake-offs in her home country of Russia armed her with the recipes to start her first business, Izba Russian Treats, in Newtown. "It's a pastime and a bit of competition of who bakes better," she says. "People exchange recipes and do bake-offs ... My grandmother would teach me the family secrets that go into the recipe. They're like my family's intellectual property that came from my grandmother to my mother to me." Rogacheva opened the cafe in June, working with French chef Philippe Koch to translate her family recipes to a commercial environment. A glass counter filled with layer cakes, filled buns and cherry-studded dough is somewhat of a curiosity on this second-hand-store-heavy section of south King Street. 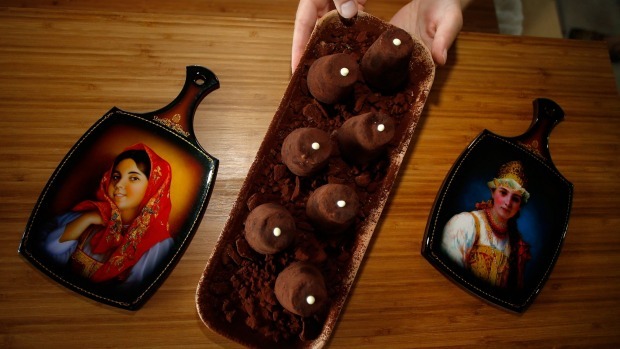 Not to mention in Sydney in general – Russian isn't the most commonly found cuisine. So Rogacheva is enticing and educating her customers one cottage cheese filled blini at a time. The sign that something is good is when people ask you for the recipe of what you make. The warm, golden pancakes arrive at the table rolled into neat little packages, dusted with icing sugar. The blini itself is slightly sour and a perfect vehicle to deliver the sweet, lemony cottage cheese dotted with sultanas. It's a delight on its own but add a dollop of the homemade cranberry jam and thick sour cream and it's a moment of sweet bliss. Minced beef with caramelised onion is a savoury alternative. Once Rogacheva adds smoked salmon to the menu – she says plans are afoot – this reviewer will be heading back for more. Other options for a lunch visit include piroshki buns, crispy on the inside, doughy on the outside and filled with either beef or subtly sweet shredded cabbage. Or slices of pie: mushroom and potato, salmon and buckwheat or chicken, encased in puff pastry. It's Russian comfort food – hearty and carb-heavy. But it's the cake display that has passers-by peering in on our visit, many tempted in for a beverage and a slice (take away is available). With only six tables, three inside and three out, and a few chairs at a counter, it fills up quickly. This isn't the kind of place to linger over a long lunch or leisurely brunch. There isn't a great amount of diversity on the menu and it's a little cramped at the tables. The service is a bit haphazard too. But it's well suited to a quick bite, and especially a morning/afternoon tea catch-up, with an abundance of sweet treats on offer. 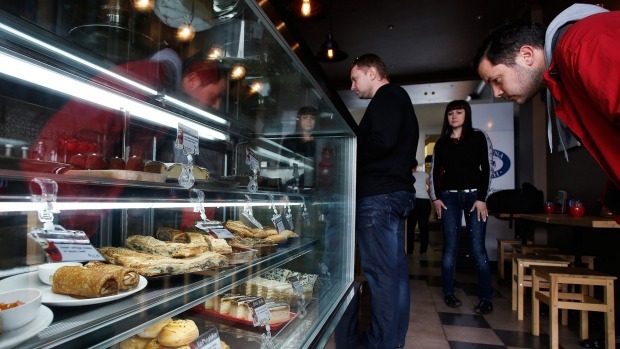 Rogacheva says the most popular is the honey cake, a series of biscuity layers softened by the sour cream in between. All-up, there's an impressive nine layers in this cake, sweetened with wild honey. A more petite treat is the kartoshka. It came about in Soviet times as a way for bakeries to use up all the cake, biscuit and pastry scraps of an afternoon. These were ground up, mixed with butter cream and rolled in cocoa. Resembling a tuber straight from the ground, they were given the Russian name for potato. The Izba version is a more elegant dome-like structure, made from its own housemade biscuit, and offers a less in-your-face sugar hit than the honey cake. So after four months putting her own twists on her much-loved family recipes, how does Rogacheva think she'd go in a bake-off now? "The sign that something is good is when people ask you for the recipe of what you make," she says. "I think now they'd be ahead of the pack." Um, that blini recipe, please?